Next week, on July 25, Lenovo and Motorola Mobility will announce a brand new high-end smartphone. Most likely, the handset in question is the Moto Z2 Force - already seen in several leaked renders. 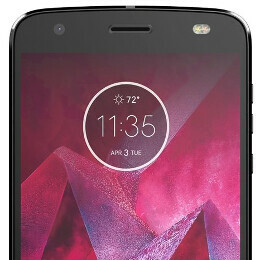 Interestingly, unlike any other Moto Z released until now, the Z2 Force might be sold by all major US carriers: Verizon, AT&T, T-Mobile, and Sprint. While we're waiting for the Z2 Force to be officially unveiled, Venture Beat today has some new details about it. Reportedly, the US version of the Moto Z2 Force comes with 4 GB of RAM and 64 GB of expandable internal memory, despite the fact that other variants (including the one expected to be launched in China) will get 6 GB of RAM and 128 GB of storage space. Another not-so-great-detail is that the Z2 Force will be about 1 mm thinner than its predecessor, while packing a 2730 mAh battery - about 22% smaller than the 3500 mAh battery found inside last year's Moto Z Force. As a reminder, Motorola did a similar thing with the already announced Z2 Play, making it thinner than the Z Play from 2016, while reducing its battery capacity. Obviously, we're not exactly thrilled to hear about this. Smaller battery aside, the Moto Z2 Force should still be an upgrade over the original Z Force, as it's going to be powered by a Qualcomm Snapdragon 835 processor (significantly faster than the Snapdragon 820 of the older phone). Other features allegedly include a dual 12 MP rear camera, a 5 MP front-facing camera, and a 5.5-inch Quad HD (1440 x 2560 pixels) ShatterShield display that should be virtually unbreakable. For now, we have no information on the price of the Moto Z2 Force, but we're expecting it to cost about as much as its predecessor - around $700 off-contract. Sweet Jesus... Go home Motorola, you're drunk. +1 and that face on the back...much more uglier than surprised robot face on LG phone. Why do some leaked renders show a 3.5mm headphone jack while others do not? Z2 Force vs Z2 Play. The smaller battery may not make that much of a difference considering how much more power efficient the SD 835 is. I'm not saying it will not affect it at all but maybe not as much as people think it may. Well it's true that we'll need to wait for battery tests to know for sure, we can probably deduce that battery life will be worse than other flagships with the SD835 and 3000+mAh batteries, which is definitely a shame. The 835 really isn't that much more efficient than the 821. My God, why does this rumor keep going around. An 821 with about 5% more battery will match the average efficiency of an 835 device. Just look at the difference between OnePlus 3T and OnePlus 5, between the S7+ and the S8+ (the S8 family, I think, actually has a smaller screen area despite bigger diagonal). Talk reviewers will tell you that the OP5 doesn't last any longer or shorter than the 3T. The difference between Xperia z premium and xz premium devices showcases what a more efficient SoC does in the face of a smaller battery--not the miniscule difference between the 835 and the 821. It's Lenovo now. Motorola would've made sensible decisions. As a former Verizon rep I can tell you battery life was the primary reason people bought the Droid Maxx, Maxx 2, Turbo, Turbo 2, and Z Force. Durability with the old Kevlar back was a close 2nd. If they want to shoot themselves in the foot and release another thin and fragile glass phone with mediocre battery life, let them question why their sales are dropping. They're doing this to promote the sale of their mods. No one I know has ever said any of the flagships in the last couple of years could do with being thinner... no one. In fact, where do these companies do their market research? Guess it will be the Pix XL2.. Thanks lenovo For making my decision easy for me. As far as your Mods, they have mini speakers and projectors to do what your Mods are going to do. iPhone 8 and Surface Mobile are both better than this garbage. I'm a psychic so yes I can tell that two unreleased phones are better. Damn! Who wants those skinny phones? Make a brick for me with a 4500mah battery. You're stepping in wrong direction. Finally a manufacturer that listens to its customers, all they want is an thinner phone, no? I, for one, love things phones. I think I'm about the only person here still using the old Sony Z Ultra (as my secondary device not primary) because of its amazing size VS. thinness. That being said, that camera "bump" is beyond ridiculous in my opinion. Why would I buy an ultra slim phone, just to have that two dementionality spoiled by an unsightly rising in the upper half of the body's backside? If the phone were 6mm thin without the bump I would consider it as a container for my service use, but when I have to add bulk to my device in order to make it sleek and uniform on a single plane, not thank you. Seems like Motorola-Lenovo is trying to fail to time.